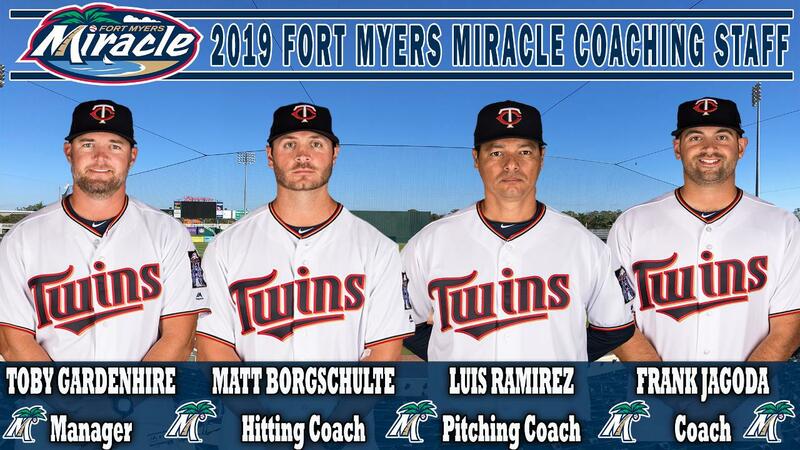 FORT MYERS, Fla. - The Fort Myers Miracle will have an entirely new coaching staff in 2019, led by manager Toby Gardenhire. Gardenhire, son of former Twins manager and current Detroit Tigers manager Ron Gardenhire, led the Low-A Cedar Rapids Kernels to a 77-62 record and a playoff appearance in 2018. He replaces Ramon Borrego, who led the Miracle to the Florida State League title last season. Borrego will manage Double-A Pensacola this season. Gardenhire was drafted by the Twins in 2002 and 2005 and went on to play in the organization from 2005-11. He played for the Miracle in 2007 and 2008. Following his playing career, Gardenhire served as the head coach at UW-Stout from 2012-16 before re-joining the Twins organization as a coach. He worked with the GCL Twins in the summer of 2016 and was the third base coach for Triple-A Rochester in 2017. "I am very excited to lead the Miracle this season," Gardenhire said. "I have fond memories of Fort Myers during my time as a player and look forward to the opportunity to defend our FSL Championship in 2019. Our fans can look forward to watching another talented group of players on a nightly basis this season." Joining Gardenhire on the coaching staff are pitching coach Luis Ramirez, hitting coach Matt Borgschulte, coach Frank Jagoda, athletic trainer Ben Myers, and strength and conditioning coach Chuck Bradway. Ramirez spent the past four seasons as pitching coach for Rookie-level Elizabethton. He resides in Valencia, VZ and played 15 seasons of professional baseball in the United States, Venezuela, Columbia, and Taiwan. Borgschulte was the hitting coach for the GCL Twins in 2018, his first season as a coach in the Twins organization. He spent 2017 as the fourth coach for the Palm Beach Cardinals and 2016 as the hitting coach at Southeast Missouri State University. He is a native of St. Louis, MO.